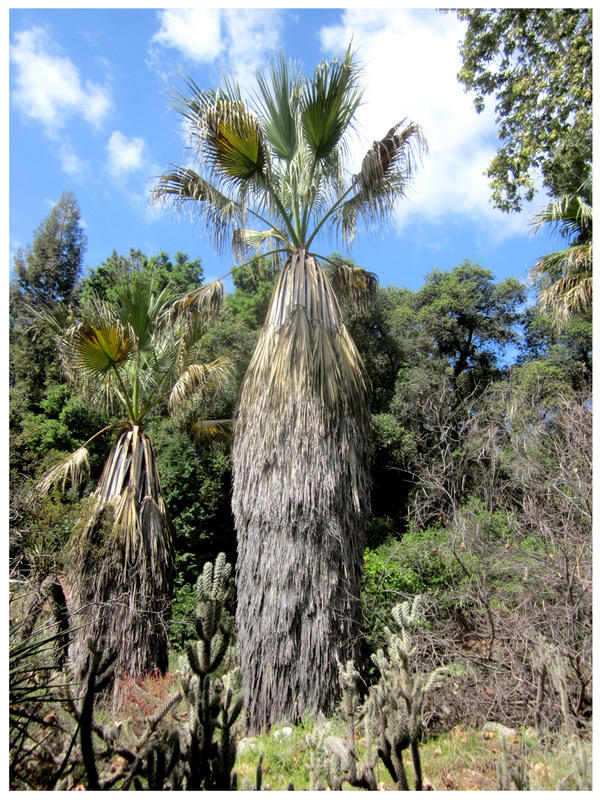 A trip to Claremont Sunday morning wasn’t meant to include a visit to the Rancho Santa Ana Botanic Garden … but I was determined to fit one in anyway. 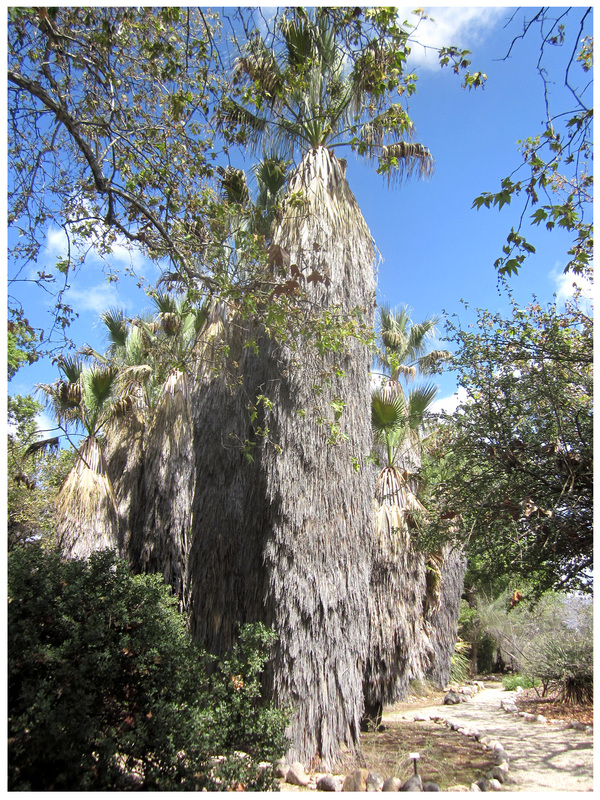 I figured we should be able to take in at least the cactus/succulent/palm gardens in the short time we had … Why visit just a portion of the RSABG? Because it’s 86-acres big, that’s why. But, I do plan to set an entire day aside in the future for a much longer visit (hike and picnic included). 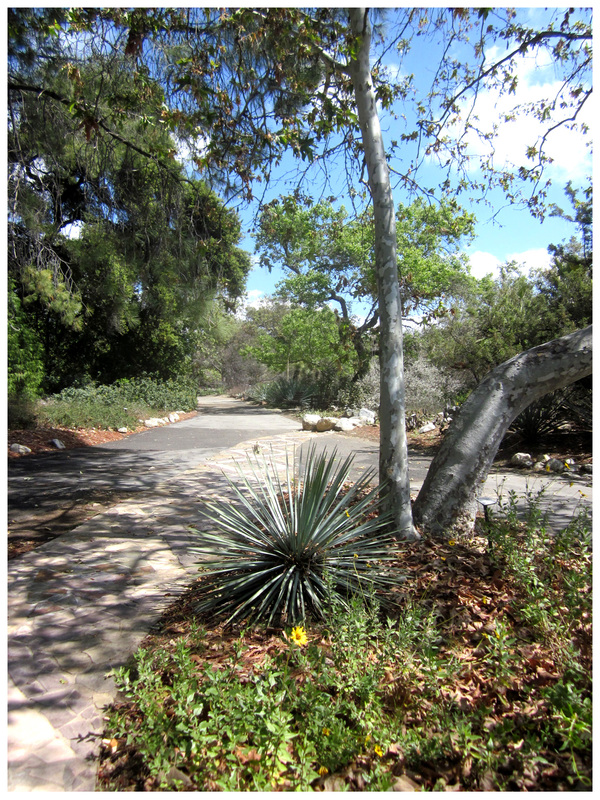 Different from other botanic gardens, RSABG’s emphasis is on native plants, trees and wildflowers … presented naturally. This means there’s not a lot of artifice; fancy hardscaping, crafty displays and manicured foliage are not part of the visual presentation. The garden does host special exhibits, however, and currently on display are enormous insect sculptures by artist David Rogers. Check out the praying mantis in the background above … it’s 18-feet long! 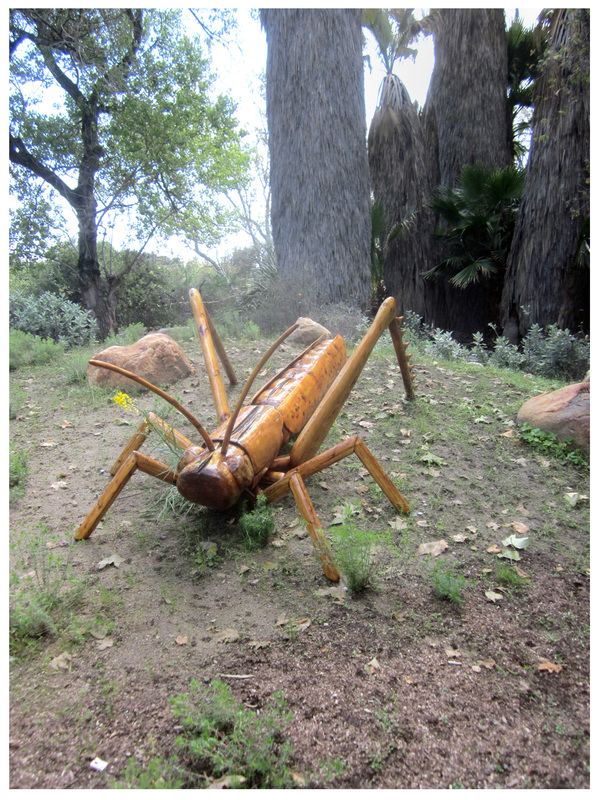 The exhibit is appropriately called BIG BUGS and hasn’t been shown in Southern California since 2001 (click here for more info). Now, full disclosure: Along with our abbreviated time-frame for touring, we, er, I was feeling the effects of a lovely dinner party the night before, so I confess I was not on my game as far as noting names of plants is concerned. I hope this un-usual omission won’t prevent you from enjoying the photos and planning a (much longer) visit of your own! 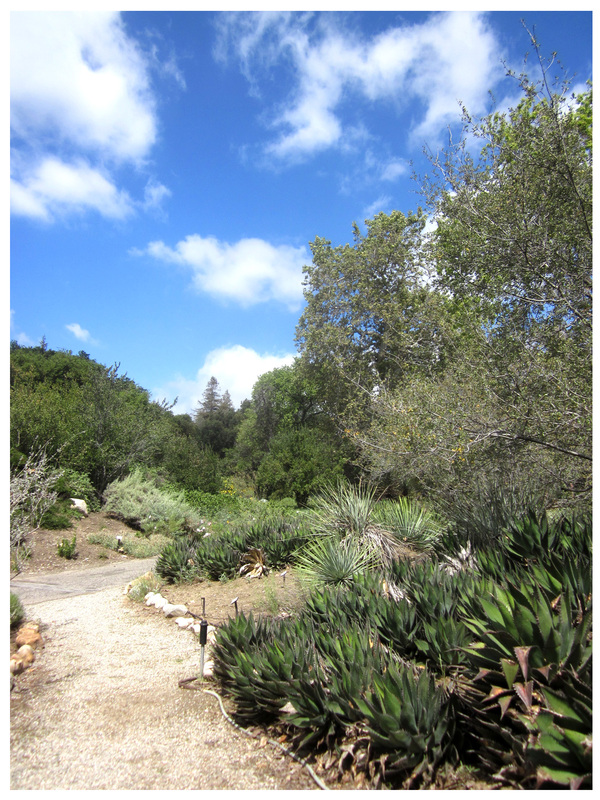 … it’s a beautiful Sunday morning and the air is comfortingly fragrant with the perfume of native plants. 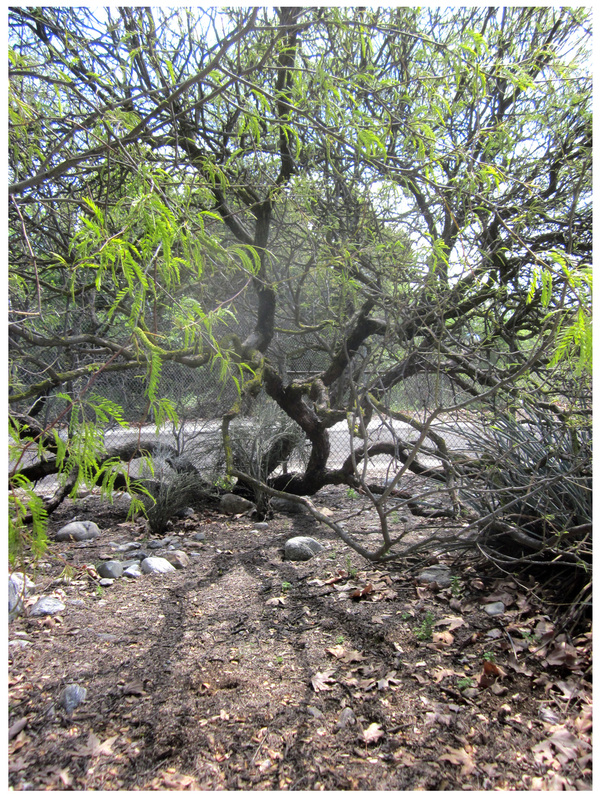 … behind us this amazing tree combines delicate, feathery foliage with darkly contrasting gnarled branches. It’s gorgeous. Moving ahead, we enter the Palm Oasis. 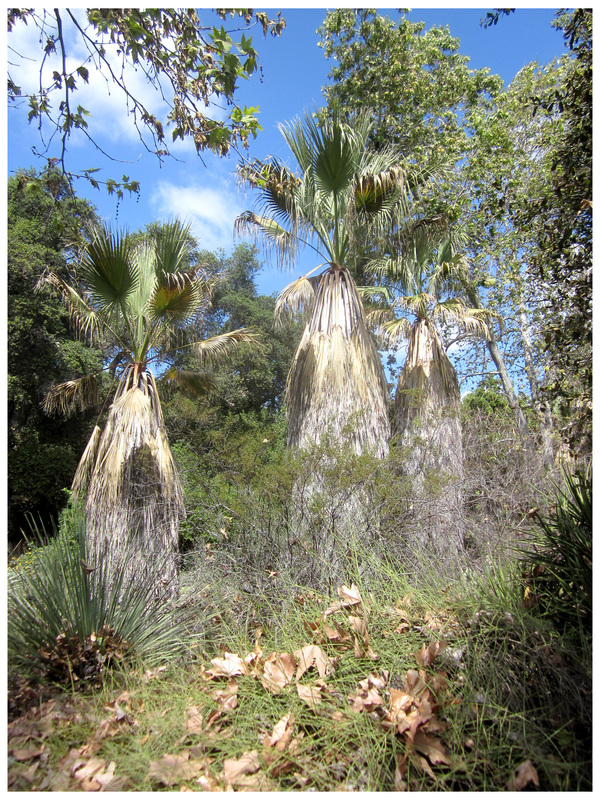 The sight of these magnificent specimens, complete with what must be decades of untrimmed dried fronds, is awe-inspiring! and, this giant is their obvious king. 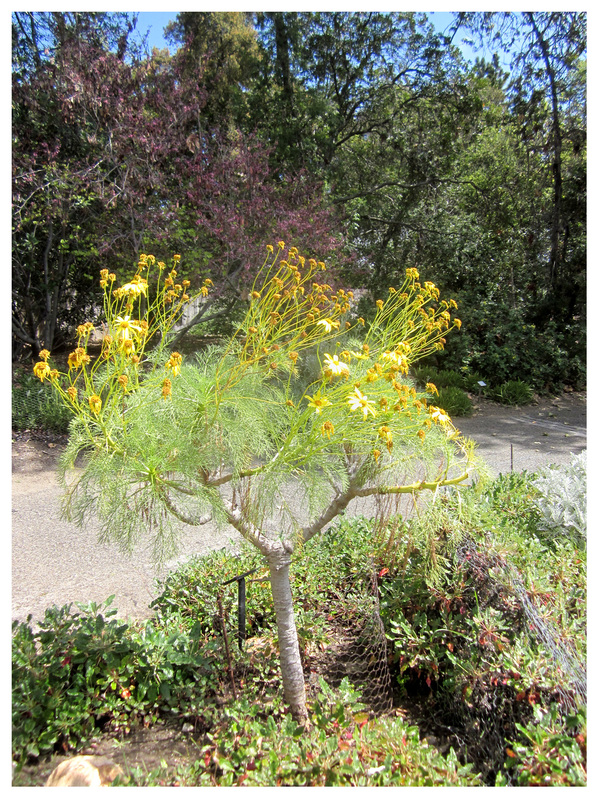 This coreopsis gigantea (I checked the tag) is both bizarre and banal at the same time … like daisies gone wild. 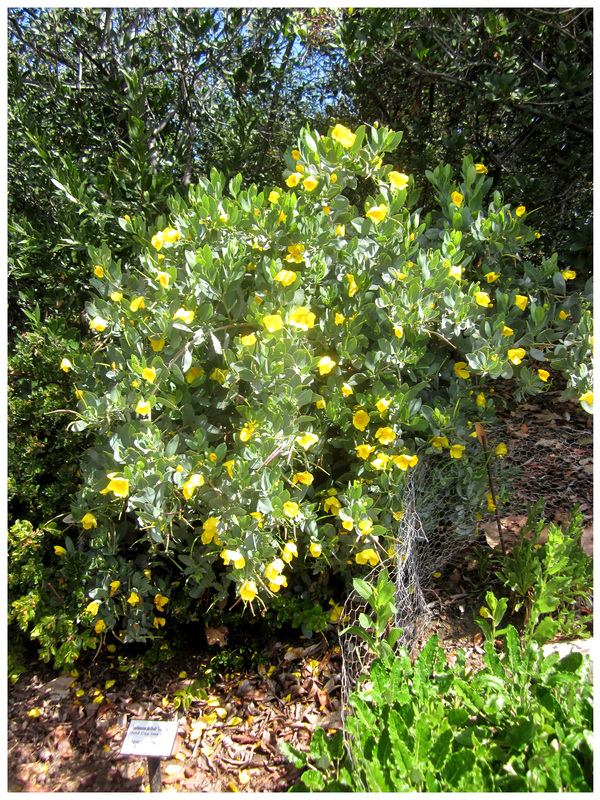 More sedate — and charmingly pretty — these gold cups formed dense clumps of buttercup goodness. 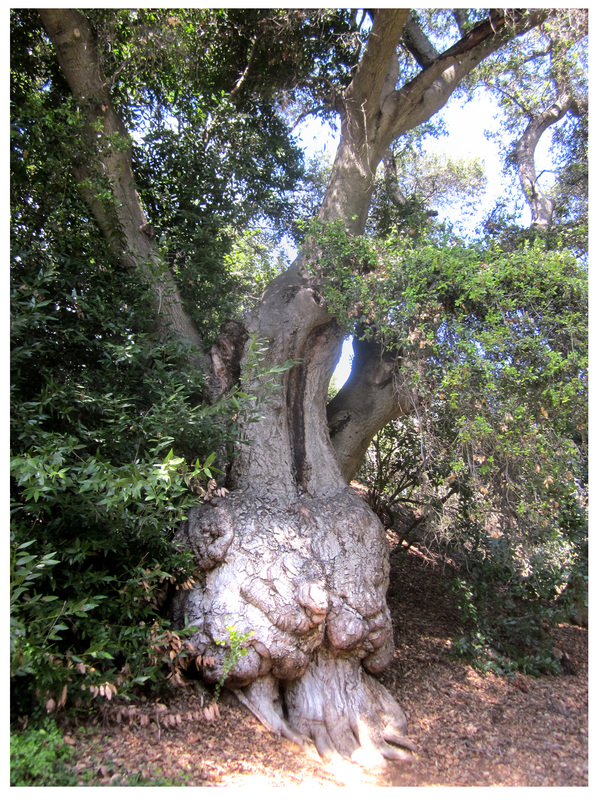 Through the trees along the path, I catch sight of this ancient tree … I’m not sure why its trunk looks like it imploded at some point, then righted itself and kept on growin’, but it’s truly majestic. Descending back onto the beaten path it’s time to depart … but we’ll definitely return, and soon. The weather’s just too perfect right now not to … I wonder if they have call boxes here and there … I could easily get lost in all that native landscape … I’ll have to check ahead; right now: Lunch! 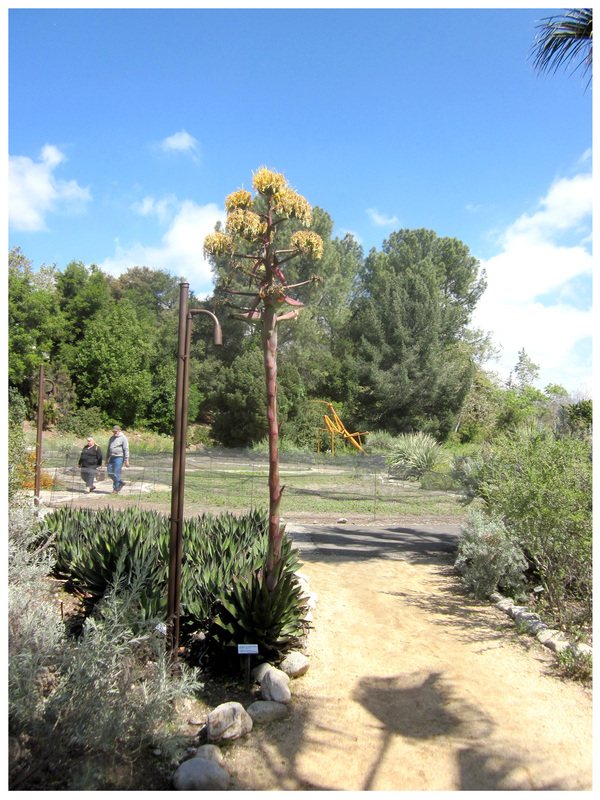 Rancho Santa Ana Botanic Garden; 1500 N. College Ave., Claremont, CA 91711; (909) 625-8767; Click here for further info and their website. Tasty lunch tip: Inka Trails Peruvian Cuisine; 1077 W. Foothill Blvd., Claremont, CA – 91711; (909) 626-4426. Delicious and near to the gardens; click here for their website. This looks like a great place, I look forward to going and checking it out myself. Plus, I’ll definitely eat at the Peruvian restaurant… maybe have a Pisco Sour… yummmm. Go, the gardens are really great … I can’t wait to explore then further! As to Inka Trails, we had very simple, vegetarian dishes and all were delicious … I wanted to eat light so just had beans, quinoa and rice and all were so good, yet so simple. I can’t wait to go back again! Nice! I’ve only been here once but enjoyed meandering around for a few hours. 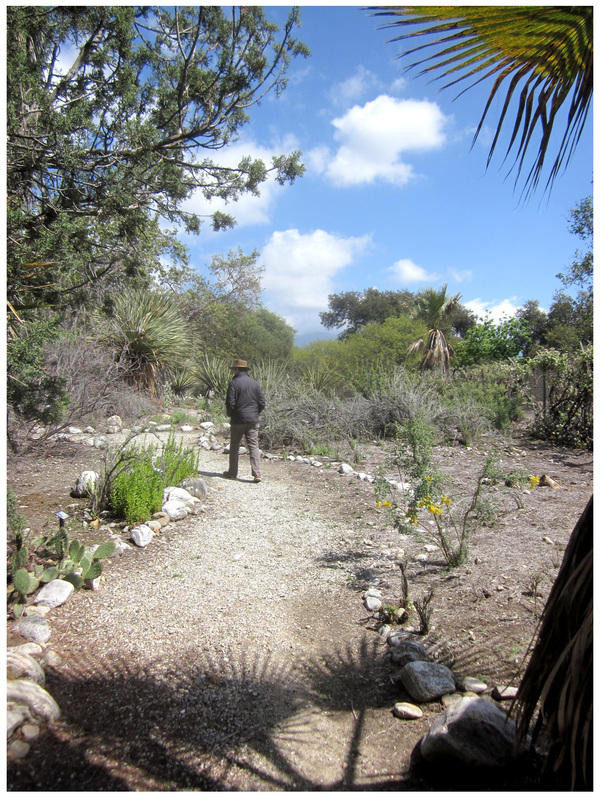 This past week, I meadered around Moortens Botanical Gardens in Palm Springs. Lots of beautiful succulents going on out there in the desert. 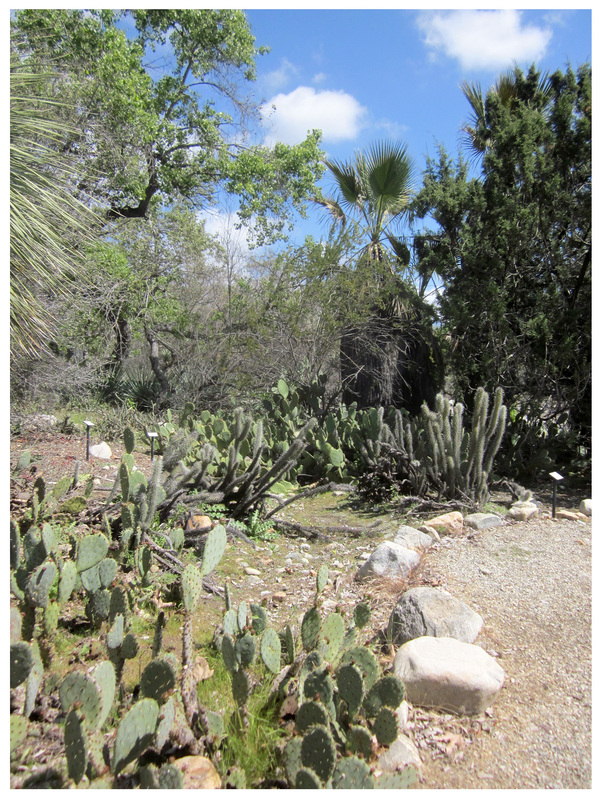 Not to mention getting to watch some baby hummingbirds fledge from the nest in the cactarium.